Delivered Dallas 16/7/44; Langley 12/8/44; Dow Fd 12/9/44; Assigned 570BS/390BG [DI-L] Framlingham 29/9/44; Missing in Action Neumunster 7/4/45 with Bill Kotta, Harvey Ainsworth, Carleton Gillmore, Jim Bowler, Chas Turner, Howard Johnson, Don Detwiler, Jim Whitling, Tom Walsh (9 Prisoner of War); shot down by Me262 jet enemy aircraft, crashed Celle, Ger. Missing Air Crew Report 13891. HARD TO GET. At noon against 12.30 o’clock is loud humming of an airplane to hoeren.Es emerges from southeast direction of a cloud, the engines howls again, it breaks in air and falls on the small idyllischen place Brunkensen, then the eye-witness Herbert Paust reported to me his observation. After the airplane had fallen, some inhabitants of the place hurried to Absturzstelle.Die the rubble of the machine were situated in the English garden, the moreover smashed a wing the roof of a barn. Many smaller sections were appropriate for inventory of the airplane in the entire place distribution that by the wind in the place were distributed. Among them the parachutes, life boats, which were in the machine. Dead ones or wounded one did not become identification gentleman trace discovered in the rubble a flier pair of overalls, therein were the document of identification of Howard L Johnson. (more to it later). As I mean find examined called the father from Mr. Paust from the house approx. 300 m far away “come immediately to house, the Americans stand in the back on the road” thereby concerned it a light advance guard. The Americans must have observed the crash, because you stood to the time to the Lippoldshöhle with a site out oil refinery of the Deurag from Hanover Misburg, which was paged out 1943 because of the bomb attacks and after completion gasoline manufactured. In the morning of the 7 April 1945 station 153 started, 4 motorige B-17 Hard To Get with the series NR in Framlingham (UK). 48225 the U.S. 8th air Force, 390th Bomb Group, 570th Bomb Squadron from the USA with her crew 75 and the pilot William Kotta to their 291. Mission, the attack on new cathedrals. Furthermore 1304 bombers B-17 and B-24 were in company of 792 mustang as well as 58 Thunderboltjaeger of bases in suedengland, which belonged the 8 USA af, to one of their last applications of this order of magnitude on Germany. In the 1896 machines was 14000 men at flying personnel. It went over the North Sea toward Germany, where the Steinhuder sea was headed for. The machines divided here and flew their applications toward Sachau, Stendal, Gardelegen, Doemitz, Parchim, Guestrow and Neumünster. Within the area of the Steinhuder of sea the Hard To Get came at a value of 26000 ft under bombardment of a German flighter pilot, to a ME 262, and met these at right wing. The pilot of the B-17 decided, which were intact entire crew those, jumps off to leave. In the area Bergen this was taken imprisoned and into the city prison in mountains transport of there out went it to far to Luebeck where the prisoners at the 2.Mai.1945 from the 8.Britischen tank army unit, which filled Luebeck, was released. 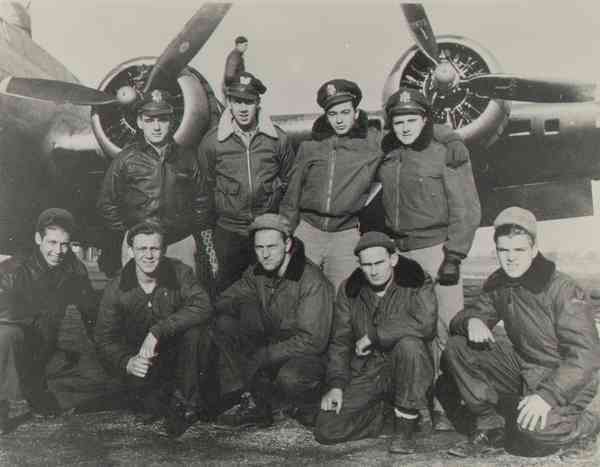 The airplane flew on after the bombardment and the jump of the crew leaderless. After the tank had dropped empty or the right bearing area (this was not found in Brunkensen), fell the Hard To Get and Brunkensen met. After our search the airplane must have been attacked from direction Holland coming in the area Verden Visselhövede by the ME 262 and in the right wing a hit abbekommen has, on which in the wing a fire broke out, rose the 9 men crew approx 12.30 (with all larger attacks a X-time meisst one hour in former times fixed) with the parachutes out and came in mountains into the city prison at that time. Was there the machine on autopilot posed flew this still 1 hour without crew further and probably well trimmed by handbills on board, which should be thrown off at height of new cathedrals, by the damaged wing a large complete circle again toward the north, you fell after our time at 12.30 o’clock by empty tanks (lack of fuel) in Brunkensen. How was the airplane found? After the airplane had fallen in Brunkensen, had Herbert Paust, as previously mentioned, foundet pairs of overalls, in which the document of Howard L Johnson was inside. Since the Americans comming in from direction of Coppengrave and had threatened Pluenderern with shooting, Mr. tracing threw the pair of overalls and the papers again away. Long time noted Mr. Tracing the name Howard L Johnson. I experienced from the crash of the bomber, after I visited the homeland room in Brunkensen. There handbill, which were in the bomb slot in the airplane, is situated as well as a cover plate of the engine of B-17. I asked older inhabitants from Brunkensen, whether someone something about the crash tell kann.Nachdem I with Mr. Paust conversed, indicated me its knowledge to this and called myself the name Howard L. Johnson. Then I began to search the Internet for appropriate pages and forums. I became acquainted with some people, which gave me the appropriate tips. Gradually I encountered pages to test it me enabled data bases in the USA. Among other things a page of the 390th BG. I input in the data base the names of Howard L Johnson also here and became find. It turned out that this Mr. Johnson at the 7 April fell 1945 in a B-17 with the name Hard To Get, which became to shot against noon. It had to be the Brunksen B-17! The data base gave me further data, me among other things the airplane number, the crew number, all flown applications, which names of the pilot as well as the crew of the Hard To Get betrayed. Now I made on the search for today still living persons of the Hard To Get, those for far on the crash day on board the machine was and discovered Mr. Bowler from Springfield. Over an acquaintance in Boulder, the USA, I got contact with Mr. Bowler. That in the meantime 84 yeard old was very much surprised, because any longer had not counted the crew of B-17 to ever hear again something over the airplane. Mr. Bowler could acknowledge everything that I had found B-17. Mr. Bowler is my grandfather and, at 95, is still an amazing role model for us. Thank you for posting this. Carleton Gillmore is my father. I had the pleasure of meeting some of the living crew a few years back including Jim Bowler. Our family is planning on traveling to Germany next October and hope to stop in Brunkensen to see the piece of plane wing displayed there. Any assistance around our trip there would be quite beneficial. We cant wait! Interessante Geschichte, gut zusammengefasst. Bin auf diese Sache gestoßen, weil ich derzeit über das “Sonderkommando Elbe” recherchiere. Brunkensen ist mir bekannt, auch die dortige, im Beitrag erwähnte “Ofen”-Anlage. Die Informationen habe ich von Matthias Baars zur Verfügung gestellt bekommen. Er hatte eine Webseite dazu, die leider nicht mehr online ist.